The CATBIRD 16 is a cruising sharpie of easily trailerable size. She is ideal for day sailing, beach cruising or camping aboard. Her rig is easy to set up and easy to handle underway. She can be built with a cuddy or as an open boat. Construction is stitch and glue plywood and epoxy over plywood frames and bulkheads. This construction uses a healthy amount of fiberglass and epoxy to seal her up. The hull goes together quickly. Outfit and trim will take the most time depending on the level of finish desired by the owner. She is ideal for solo or family adventures. Purchase and Download Study Plans for the CATBIRD 16 for $5.00 in PDF format (zipped file). 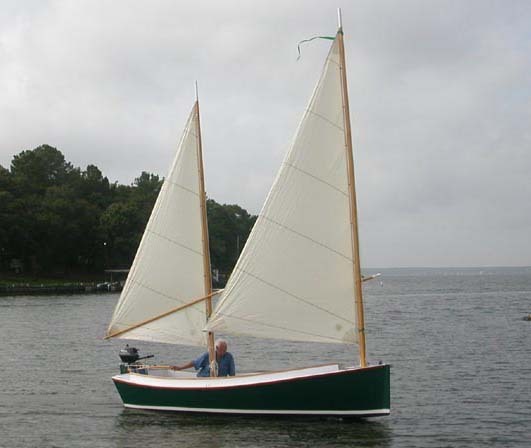 Purchase Construction Plans for the CATBIRD 16 for $80.00 for delivery by US Postal Service. Purchase Full Size Frame Lofting for the CATBIRD 16 for $80.00 for delivery by US Postal Service.